Are there not times in life when we believe we have received a death sentence—our misery and trouble are so great? Thankfully, this is not an everyday experience, but all too often in life we see off in the distance a dark, gaping horizon that leaves us feeling hopeless and lost. St. Paul experienced that when ministering in Asia (Minor), when he was so utterly, unbearably crushed that he despaired of life itself. There is the temptation, surely, to give up altogether. And yet, as with Paul, God delivers us—and will deliver us— so that we set our hope on Him, that He will deliver us again and again from our trials and troubles. These trials and troubles help us and strengthen our faith so that we come to rely not on ourselves, but on God who raises the dead. And not only the God who raised Jesus from death, but the God who raises us from our living death, raising us up time and again when we are down and disheartened. How could we learn to rely on this God, if we could not experience the depths of despair? The great troubles and difficulties in life go hand-in-hand with God taking us by the hand and lifting us up out of our dark hole. Even as the Father took Jesus by the hand, dead and buried in the tomb, and lifted Him up to new life! I hope and pray that all is well with you on this Tuesday of Holy Week. 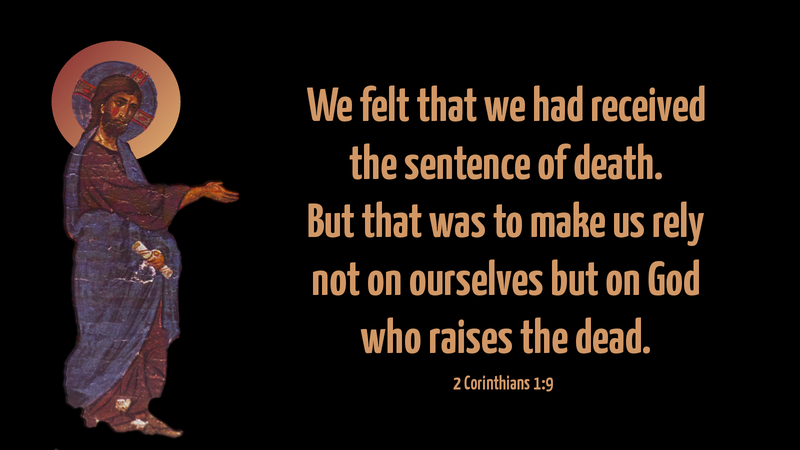 But for those who may feel as if they have received a death sentence in life, may your faith be strengthened by the One who raises the dead—and who will raise you to renewed life in Christ Jesus! Prayer: Almighty God, be with us through this Great and Holy Week, as we learn to rely on You, who raise the dead and give new life to your children; through Christ our Lord. Amen.